The Earth is like a box of chocolates. You never know what you’re going to get. A long time ago, the local council put in new sewage pipes in the town where I grew up. The smell was overwhelming. Normally, a smell of coffee would permeate the town whenever the wind went northwest: the main employer was the local Douwe Egberts coffee factory. My father worked there on developing instant coffee. He never drank it himself. The taste of instant coffee did not compare to Douwe Egbert’s real coffee, and the process of making the coffee powder used far too much energy, in his opinion. The whole thing smelled wrong. The smell of sewage that came from the deep hole lasted for several weeks. But whilst the nose strongly objected, the eyes were glued to the hole. The sandy soil turned out to be strictly layered, with thicker and thinner layers of sand and clay of different colours. One deep, thin layer was bright green, far more convincingly so than the green beach at the southern tip of Hawaii. The town was about a meter above sea level, which locally made it a hill; the sandy soil made it an anti-oasis of poor gardening. The ‘hill’ signified an ancient sand bank that had build up when this area was near the coast. Every time the land subsided or the sea rose, the area would again be flooded, and the sea would deposit a new layer of sediment and sand. The shape of the sea still shows up in the land, even though the elevation differences are no more than tens of centimeters. Trees also provide clues: small difference in the soils give large difference in the height of the mature trees. And now, the different layers in the hole showed how this land had been build up, in a battle with the fluctuating sea. I never found out how old the various layers were. Perhaps the Earth isn’t really like a box of chocolates. It is much more like a layer cake, where every layer looks and smells different. The layers in our sewage hole were closely spaced and a well-dug hole could reveal all. Other places are not so lucky. In the US, where everything is supersized, it takes a hole of gigantic proportions to show the roots of the land. Luckily, nature has provided one. We had driven up from Tucson, through the desert landscapes of Arizona. After Flagstaff, the first volcanic cinder cones appeared, a reminder that this dry land was still very much alive. The last eruption may have been only a thousand years ago. As the altitude along the road increased, the shrub desert gave way to forest. The camp site appeared and we put up our tent amidst the trees. Nothing in the landscape gave any indication of the humongous hole nearby. Even a few hundred meters from the Grand Canyon, there was little to show the approaching end of the world; perhaps there was even a bit of a lack of scenery. 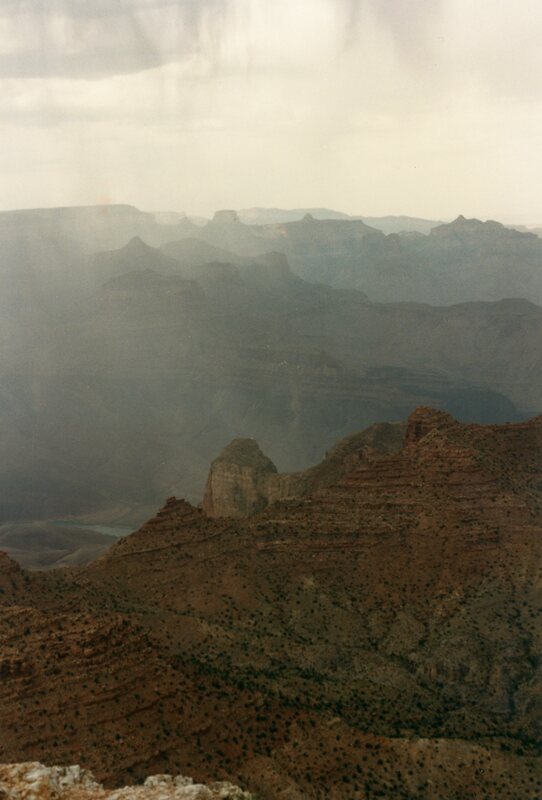 It is notable that few photos of the Grand Canyon show the plateau around it. At the rim, the first impression was earth shattering. The early June air had been clear during our drive up, but now there were some showers over the canyon. They gave the impression of a broken curtain hiding part of the view, but with enough clear gaps to show the far side of the canyon, a kind of window-gazing a world away. The colours were unreal: every rock seemed to have a different hue. It took a while to get a sense of the scale, to realize that what appeared to be a rock on the other side, was large enough to be a mountain in its own right. The scale of the abyss was unbelievable. The river wasn’t visible immediately below: you had to look along the canyon to glimpse it. These first few minutes at the edge left us speechless. What would it have felt like to the Spanish expedition who found the canyon, and knew that their quest for El Dorado was over? What was it like for the Indian populations who lived below? Did the views make the hardship worthwhile? You could easily believe it did. 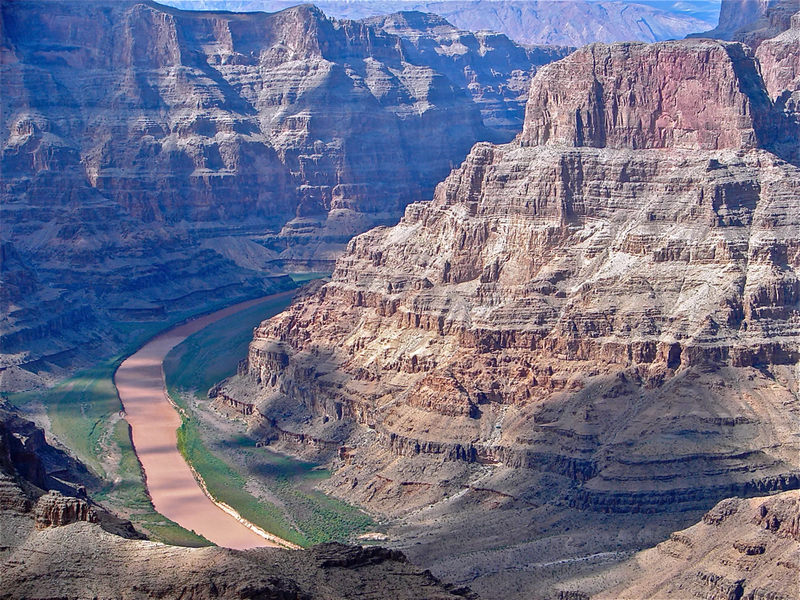 The Grand Canyon is 1800 meters deep and 450 km long. Even so, it is neither the largest nor the deepest canyon in the world. In the US, Hell’s Canyon is deeper. In Peru, Colca Canyon is twice the depth of the Grand Canyon and in Nepal, the Kali Gandaki Gorge is more than thrice its depth. Yarlung Tsangpo Grand Canyon in China is 500 km long, and an unnamed canyon under the Greenland ice cap, only discovered 5 years ago, is 750 km long. Still, these canyons are invariably compared to the Grand Canyon and that already shows the public perception. None of the others are as accessible and none are as well known. And standing at the edge, it seemed hard to believe that anything else could possibly compete. Early the next morning, we drove back to the Canyon. The air was now completely clear, and it felt like you could reach out and touch the far side. The intricate detail made it seem like a picture frame. Everywhere we looked the rocks showed horizontal layers. They came in bunches. One bunch would create a vertical wall. The next bunch might create more of a slope. At the bottom, the river responsible for this mayhem stared back at us, as if to say, ‘who, me?’. The fact that the layers were all horizontal showed a lack of tectonic upheaval. This area has been calm for a long time. But it is not completely silent. There are occasional earthquakes here, about one every two years. There was an M4 in 2013, an M5.6 in 1992 and another M5.6 in 1959. The earthquakes tend to be around the volcanic field near Flagstaff, and north of the Grand Canyon near the border with Utah. You would not want to be in the canyon during an earthquake! Oblivious to this risk, our goal for the day was to go down. We had picked the South Kaibab trail. This was back in the days when it was still possible to park at the trail head. Nowadays, there is a free bus service to get you there. Finding the trail was a matter of following the early-morning crowd. The path began at the rim and zig-zagged down a side gorge of the canyon. The day was not yet too hot, a good thing since shade seemed in short supply. The foot path seemed suicidal at times but was in fact remarkably well designed. The hike became a kind of a geological Benjamin Button. Each step down took us further back in time. The lower the layer, the older the rock. The early zig-zags took us down a rock face of hard lime stone. These were the youngest rocks, deposited most recent. But in the Grand Canyon, ‘recent’ is a relative term, something like a young centenarian. These rocks were 260 million years old! In the time since they were laid down, continents had drifted, dinosaurs had evolved and become extinct, birds had evolved and survived, and a small tree-dwelling primate had become a primordial Eve and given rise to all of humanity. Of all that history, there was nothing here. It was as nothing had happened since the days of the first reptiles. Further north, in Bryce Canyon, much younger rocks exist, some even deposited within the last few million years. Once such rocks had been at the Grand Canyon too, but erosion had removed all trace. Only the lime stone had been hard enough to survive the erosion. 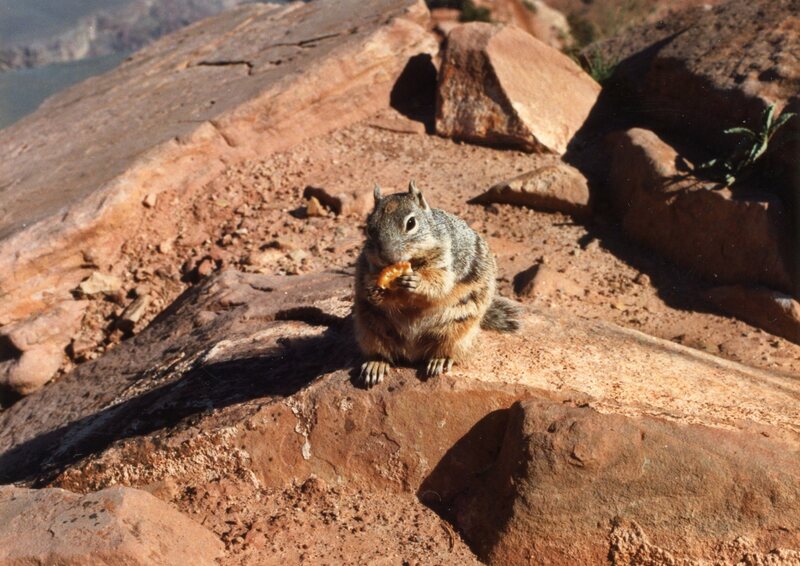 This already showed us one of the important aspects of the rocks of the Grand Canyon. There is time missing. Sometimes, the processes that deposit new layers had failed. New material can be brought in by water, by wind, or by volcanic eruptions. But when nothing happens, the book of time is never written. At other times, new rocks did form but erosion had later removed it again. And so, in the layer cake of the Grand Canyon, subsequent layers may come from different times, deposited in vastly different environments. The missing time is called a non-conformity. 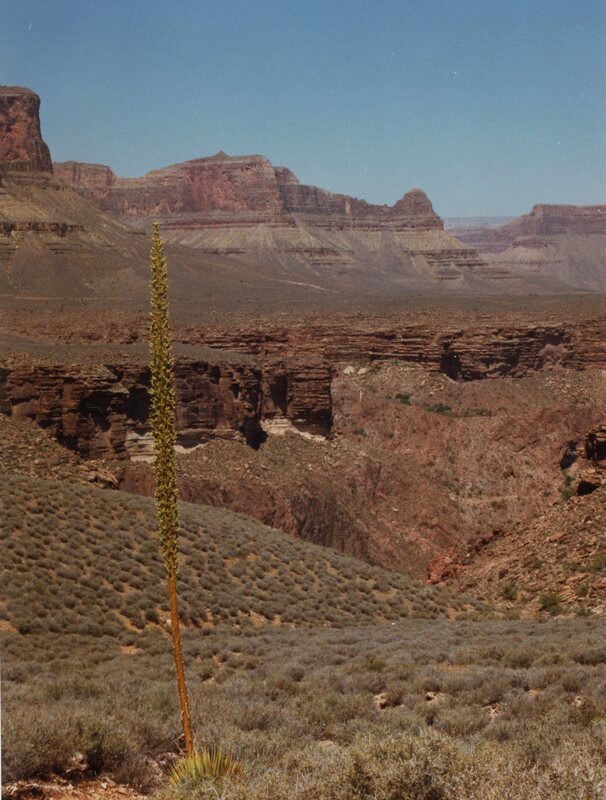 The hard limestone was called the Kaibab, the same name as that of the trail itself. 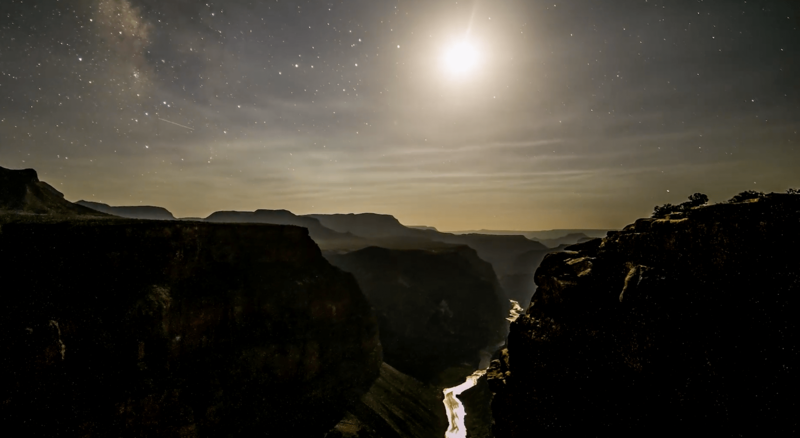 The word comes from a local Indian language and means ‘lying-down mountain’, and apt description of the Grand Canyon. The Kaibab were the rocks we had camped on. They dated from the Permian, when the world’s continents had come together in a supercontinent, called Pangea. The collision between Laurussia in the north and Gondwana in the south had created a long mountain chain, the Himalayas of their time. They still exist in the form of the Appalachians, now much eroded. North of the mountains, the land had subsided a bit and a shallow sea had formed. The sea was salty and tropical: the warm water allowed the limestone to form, complete with fossils of the corals of the days. At the other end of the shallow sea, these corals grew into the Capitan reef, another attraction that still exists today. The southwest US really is a geological treasure box. The date brings to mind the Permian extinction, 251 million years ago, when life almost completely disappeared. The immediate cause of the mass extinction was the Siberian traps, some of the largest on-land volcanic eruptions the Earth had ever seen. The eruption filled the air with CO2, and the deadly heat killed over 90% of all life. But that extinction event was not seen here: the rocks of the Kaibab end just before this disaster. 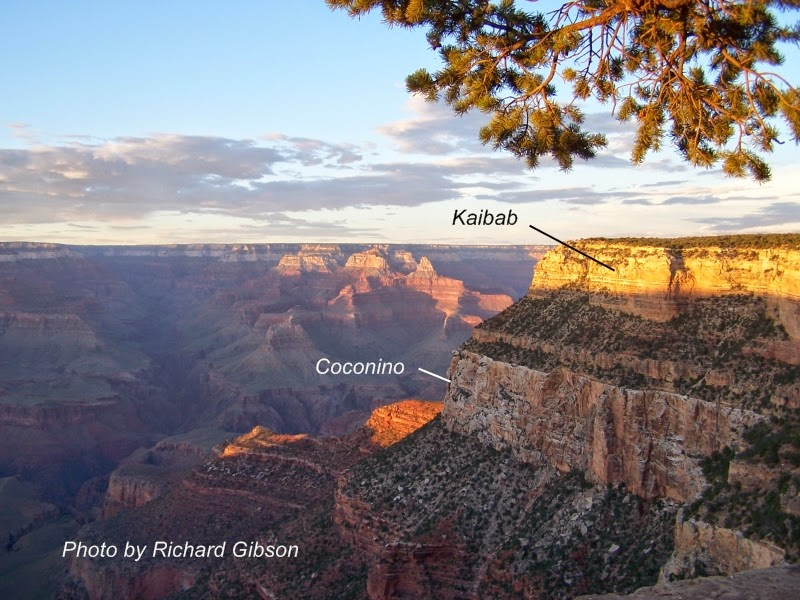 The Kaibab was not a uniform block; it consisted of layers with slightly different composition, perhaps as the shallow sea changed. The layers were clearly visible in the rocks. But as we descended the rocks changed, and the slope became less vertiginous. These rocks were called the Toroweap, and had formed 270 million years ago. At that time, the sea was just reaching here and the Grand Canyon was near the sea shore. Sometimes the sea would cover the area and sometimes it would withdraw; the alteration gave a mixture of limestone, gypsum and sandstone. We had reached the end of the gorge and the view opened up, showing the Grand Canyon vistas properly for the first time. But the rocks changed again, and the trail clung perilously to a vertical cliff. The cliff was the Coconino formation, a yellowish, hard sandstone. The layers were no longer strictly horizontal but showed angled lines. The cross bedding was the tell-tale sign of fossilised sand dunes. We were now in a time before the shallow sea, when the area was an arid sand desert. The sandstone was rock hard. There are several mnemonics available to remember the order of the names, Kaibab, Toroweak, Coconino, and so on. Richard Fortey tells of one that starts ‘kissing takes concentration’; the mnemonic for the following layers is not entirely suitable for a public blog. Less controversial ones can also be found. But the basic problem remains that geological names just do not roll of the tongue. Now the trail followed a ridge, with views in all directions, and the rocks had almost instantly turned red. This was the Hermit Formation, eroded remnants of a softer rock. There is a sharp distinction between the Coconino and the Hermit Formation. The Hermit, a fine sandstone mixed with siltstone and mudstone, was deposited when this area was an ephemeral floodplain; it frequently dried out. Seasonal rivers would flood an otherwise quite dry environment. It was much like the Okavango, but without the elephants (although possibly with the mosquitos). 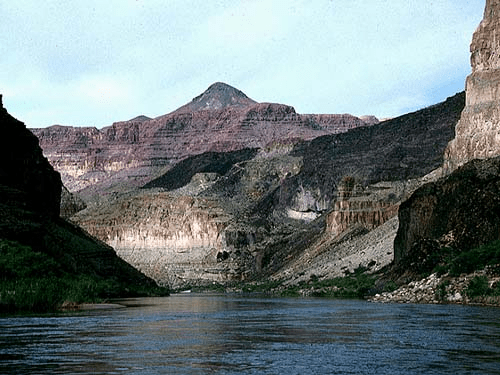 Later, the rivers stopped flowing and the area became a desert: this river failure marked the boundary between the Hermit Formation and the sand dunes of the Coconino. The Hermit Formation formed some 280 million years ago. The trail reached a solitary peak, and started to come down its steep side, into the canyon. The steep rock face consisted of blocks. This was the Supai formation. At times the rock face had really seemed impassable. 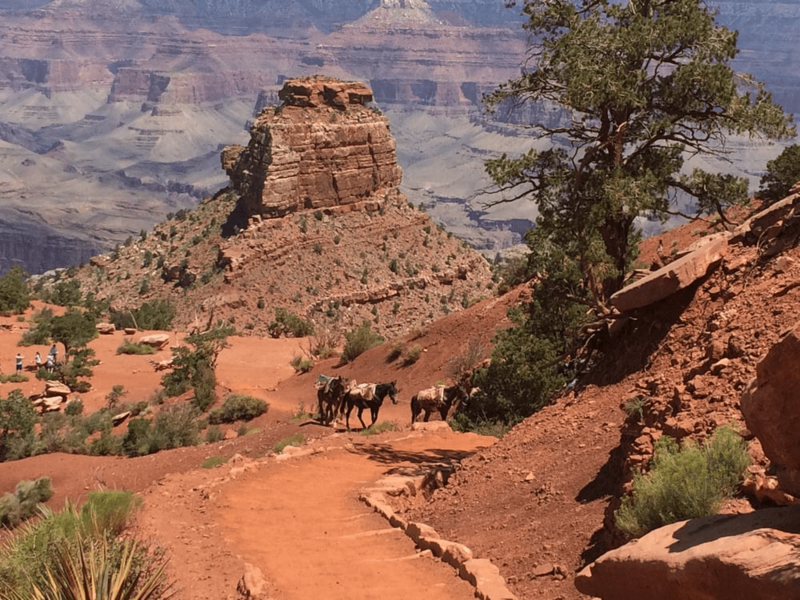 The South Kaibab trail was made using dynamite: it was easy to see why! The trail bypassed a sheer face of red stone, appropriately called the Redwall formation. Looking harder, the red turned out to pretence. The rocks themselves were in fact white. The red colour was a varnish coming from the red Hermit above. Below the Redwall, a shallower incline heralded the Muav Limestone. This was another marine formation, formed off-shore in relatively deep water, 510 million years ago. The rise of the sea was not unique to this region: it was seen worldwide. Typically, when a supercontinent has formed, the sea floor is mostly old. Sea floor is warm when it forms in a rift. It cools down as it ages, and this makes it contract and increase in density. For this reason, old sea floor is much deeper (5-6 kilometer) than young sea floor. During a supercontinent, more of the sea floor is old and deep, and therefore sea levels are low. When the continents break up, there is a lot of new, warm sea floor which is much less deep. Thus, sea levels rise and the low-lying parts of continents flood. This was the situation in the Cambrian, when the future Grand Canyon found itself near the shore, but in deep water. The slope shallowed dramatically as we arrived on a large platform called the Tonto. This platform had been obvious from the top of the Grand Canyon. These rocks were called the Bright Angel Shale: we were still in an ancient sea. The rocks had a greenish colour, glauconite, which only forms in sea water, under conditions of low oxygen. On the platform, the trail picked its way between the fallen rocks. Laurussia formed between 480 and 410 million years ago, when the core of old North America collided with the Baltic shield and with other floating bits of northern hemisphere. The collision with Gondwana was 300 million years ago. The Grand Canyon layer cake we had seen so far had all come from the long-drawn formation of Pangea. We were not planning to descend to the river itself. That would be too much for a day return, especially this close to summer. Instead, here on the Tonto Platform we turned left, and followed a trail along the platform. Now we were alone. The number of people had been dwindling as we came down, but everyone else seemed to be be going down to the river. The trail curved along the slope. At times it was harder to keep balance on the slope, even though it was not particularly steep. We now walked between low bushes, and we quickly found out it was best to keep bare skin away from them, or risk having to leave some of it behind. We were getting tired and I had to sit down for a bit. Luckily we still had water left. The deepest part of the canyon that we missed was very different to the trail that we had seen. The top, just below the Tonto platform is another horizontal layer: it is a hard sandstone called Tapeat, which formed 510 million years ago. It is the remnant of a pebble beach, predating even Laurussia. There is sandstone here too, with cross bedding but at a steeper angle than the Coconino. This sand was deposited near the beach in sea water, swept in ridges by the currents and waves. In fact, it had formed very much like the fossil sand bank where I grew up, but dating from the time of the Cambrian explosion. Below this, the canyon cuts into heavily distorted rock. No horizontal bands here! In places, granite shows the heart of an ancient mountain from a time long before Laurussia. The continents had come together once before, about 1.2 billion years ago. This earliest known supercontinent is known as Rodinia (Russian for ‘homeland’). The collisions created a mountain chain which ran close to that of the Gondwana/Laurussia collision. There is little left of it, but in places you can still see the remnants. One such area is Central Park in Manhattan: the rocky outcrops come this collision – a Russian legacy in the heart of Trump-land. But the base rocks of the Grand Canyon are even older than that. The Vishnu complex, the bottom of the Canyon, presents the true birth of Arizona. But its story is not easy to read. Everything here is meshed up. The oldest inclusions are mafic. There are remnant of volcanic dikes here, dated to 1.8 billion years, but the rocks that they intruded must be even older. Other rocks show pillow lavas and magmas, and remnants of turbidity deposits, mud flows into deep oceanic trenches. This part of the history has been dated to 1.75 billion years ago. About 20 to 30 million years later, the area had become a subduction zone and a volcanic arc had formed, similar to what Indonesia is now. The Gand Canyon rocks contains remnants of plutons which are typical for such arcs. Later, granite magmas intruded into the rocks, 25 kilometers deep below a mountain range. Continental fragments had collided here to form those mountains, but it is is hard to know what had collided with what, after all this time. Tellingly, both Canada and Northern Europe contain rocks of similar age. Over the next half a billion years, the mountain range eroded away, bringing the granite to the surface. The region had drifted around, broken up again, and found other continental colleagues: this was the time Rodinia formed. It threw up a mountain range that too is now long gone. New sediments, perhaps the eroded Rodinia mountain, re-buried the surfaced rocks. When Rodinia broke up, it caused faulting. Bits of the surface were raised, whilst others sank. The raised bits eroded down to the already ancient rocks. The sunken bits did not. And finally, another half a billion years later, the region was buried again under the beach deposits of an encroaching Cambrian sea. Shortly after, Laurussia formed, and the recent history of the Grand Canyon had begun. Nowadays, where the Rodinian surface was eroded, the Tapeat lies directly on the Vishnu, hiding over a billion years of history. Elsewhere, the Rodinian surface still exists and lies in-between the two. 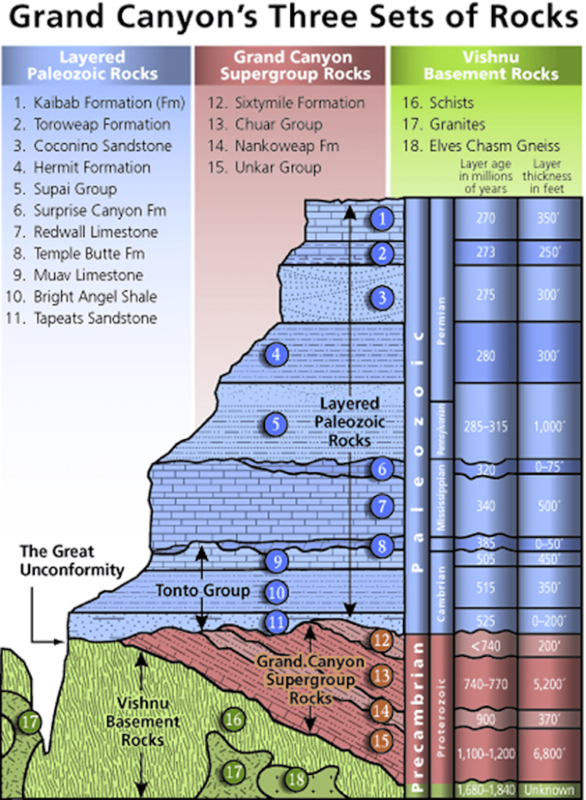 But even here, at least 200 million years is missing, an unconformity of history. Whatever happened left no trace. None of this we saw. Instead, we followed the horizontal Tonto trail, walking on stone left a trifling half a billion years ago. The track followed the contours of the land, moving back and forth but without much up and down. Finally, it crossed the main trail into the Canyon, the Bright Angel Trail. We turned left and began the long slog up. Unlike the South Kaibab, this trail followed an old fault line. Because of this it had captured a bit of water. There were some trees along the trail and the shade they gave was much appreciated. 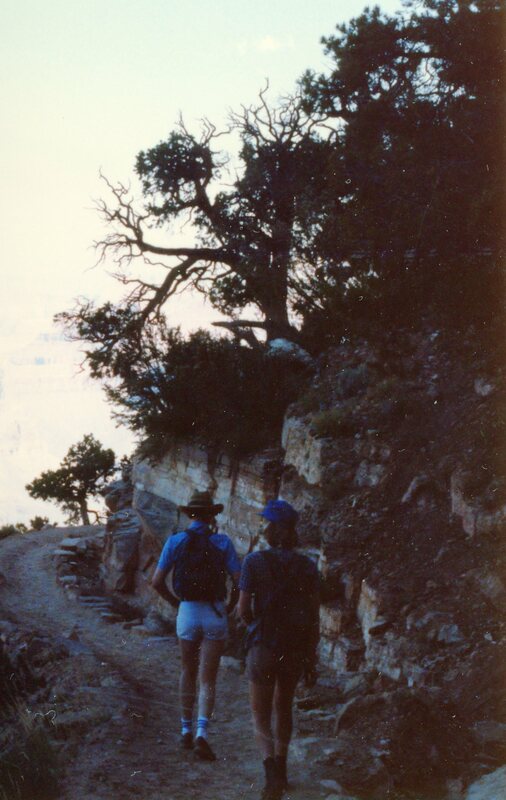 The water fountains along the trail were gratefully used: the South Kaibab trail had lacked any trace of water. We were now getting back into the tourist crowd, with everyone climbing back at their own pace. Sweat poured out of every pore and my red face seemed covered in white salt dripping into my eyes, a personal replay of how the Hermite had formed. Each laboured step up became a step forward in time. The continents drifted around us. Below us, Rodinia broke up and send its fragments across the world ocean. The north came back together as Laurussia. We saw Gondwana approach and collide, throwing up an ancient Himalayas to the south. We stepped through the shallow sea of the Muav, and saw the desert come and claim the land. We saw the land subside and the Permian sea advance from the Nevada shoreline, creating a coral extravagance. But the climb was too hard to spend much time looking back at the wonder of the rocks and scenery, or even at the sparse wild life staring suspiciously back at us. As we came back up higher, it became harder to breath. The rim of the Grand Canyon is 2 kilometer, high enough that acclimatisation is helpful. When the rocks of the Grand Canyon were laid down all this was near sea level. Why was it so high now? The rise of the land came relatively recent. In fact that rise had been responsible for the Canyon. The Colorado River was already here; when the land rose up, the river had to cut down in order to keep flowing. The initial cut happened perhaps 5 million years ago. Erosion went faster during wet times. The river carried the stones that fell into it, and those stones helped further to cut the channel. Some layers eroded easily, and this allowed to Canyon to get so wide. But the ancient granite at the bottom was highly resistant: it had seen all of this before. Here the river could only manage a narrow, albeit deep gorge. The first person to traverse the river from one end of the Canyon to the other was John Powell. He later founded the USGS. So in a way, the river not only made its own bed, it also fathered the organisation now tasked with protecting its creation. I mentioned that the youngest rocks are a staggering 250 million years old. That is not entirely true. Further along the canyon, there has been some volcanic activity even in the past few million years. The lava flows tumbled into the gorge and blocked the river, forming large lakes. Eventually, or perhaps quite soon, the dam was breached, and an enormous flood would come down the river. Erosion multiplied, and the river quickly removed most traces of the recent lava. Having walked up a different trail, we ended up at the rim at Canyon Village, miles away from our car. One of us (not me) volunteered to get it. He came back amazingly quickly, having been given a ride by an Indian family in the back of a pick-up truck. Silently we drove our ancient green car back to the camp site. At the end of the day, all we could do was to crawl into our tents, exhausted and happy. And in the morning, I woke up to the sound of breakfast and the smell of coffee. Nice post Albert! Also lived near a Douwe Egberts factory, I know that exact smell! Anyone know how Kadovar is doing? Now you have made me curious as to which of their factories. Ours was the original one, dating back to the 1750’s. Yes that also sounded familiar to me about the smell. I used to live in a suburb of Birmingham (UK) called Stirchley. The prevailing wind there is from the South West. If it ever blew from due West it usually brought rain… but the smell would give us warning. Due West of Stirchley is Bourneville HQ and main factory for Cadbury’s chocolate. Rain isn’t ALL bad news ! Oooh lucky you, smell of Chocolate! All I get when the wind changes is the smell of rotting seaweed in the summer! Lovely post Albert! Thank you. I had a brief visit a few years ago using one of the helicopter flights out of Las Vegas. The whole place leaves such an impression. And what was fascinating was during the flight out, we could see volcanics leaving marks in the area. Our pilot pointed some of them out to us. We were also lucky to see some of the rare birds of prey in the gorge. I only read now the post about Bardarbunga by down under/ Andrej: quite amazing post. And looking at it, I came with a new theory: that magma might also find a way up the south rim and then turn westwards at around 10km (as seismicity shows an abnormal extension towards that direction), and then form a dike to the southwest towards Veidivotn, something which is relatively common in Bardarbunga. But it would require fresh deep magma arriving from a magmatic plume pulse. I wonder if rifting there might trigger activity at other volcanoes in south Iceland. Katla is probably at a point where an eruption is inevitable, and hekla seems to be able to erupt at any time with the more frequent eruptions it does after 1970. It didn’t erupt in 1477 but at that time hekla also didn’t erupt every decade or two so it might be more sensitive now. After holuhraun there has been significant deep magma activity under askja so volcanoes near veidivotn might be similarly affected by an eruption there. Clive did you see any condors? When I was there apparently they were having to discourage the condors from hanging around the tourist area. One of them was interested in shoelaces. I believe it was the California Condor I saw, which are on the endangered list but some hang around the Grand Canyon. I managed to catch it on video soaring above us while we were on the canyon floor. I didn’t realise the significance until a bird-loving pal watching the clip told me – he was amazed to see it. Our shoe-laces were safe at all times! This is now a good few years back so my memory might be suspect, but I’m pretty sure that was what it was. They have been re-introduced and seem to like the Grand Canyon. They could become a nuisance I guess. Condors eat anything dropped and tourists will drop anything edible, so the two go together really well. In the UK red kites seem to move into that role. Agree Albert, getting Red Kites on the West Sussex coast now. They were introduced and people started leaving uncooked chicken out for them so they are doing really well now. Lovely to see them and so far they are not a nuisance as they mostly stay along the Downland areas but are also venturing along the coastal plain. Yes, they have been reintroduced to Grand Canyon. I was there 20 years ago, but apparently they now have > 50 birds and a breeding population. They are at Big Sur also Pinnacles parks. Related to Andean condor, and not really a bird of prey, more a giant vulture. “give us the hotdog or the poodle gets it1” type thing.. The most recent eruption in the area was in about the year 1050, just north of the canyon. Wasnt that also around the same time as sunset crater formed? 1060 I think. Maybe they were related somehow. Yeah, there were several eruptions from the volcanic fields in the region at the time. There was an episode of Basin and Range extension. Yep, that sounds plausible. A few additions: a glaciation could have stopped sedimentation build up (much lower sea level) rathe than erosion (glacial erosion is normally pretty obvious). The time scales are rather long for a single glaciation but it may well form part of what happened. The stability of supercontinents is probably driven more by the oceans than by the continents. Heat can build and can give rise to flood basalts, but flood basalts seem not to split continents by themselves. The Siberian traps, nor Columbia/Yellowstone did that. The Greenland/Atlantic flood basalt did, but as the last part of a process that had been splitting the continent for a long time already. I expect that the formation of subduction zones is probably more important in tearing the supercontinent apart than any continental hot spot. Well done, (though a bit worried you “done goo”…). Best wishes for speedy recovery. Thumbs up! I am very glad to hear this. Give the Doc the appreciation for his/her work from VC! Great news! Hope the pain is better today. Good news, can’t keep an old sailor down for long. Well, they let me out. Stuck at Navhosp waiting on meds. Apparently the rabaul volcano observatory are considering the possibility for kadovar to go caldera. Best to look at in perspective. It is MUCH smaller than Krakatoa was A 300-meter tall, steep cone can erupt 1km3 (going deep below sea level) but would have difficulty doing more. Water and lava is an explosive combination and this could be dangerous. But mainly locally. The tsunami warning is speculative, but is necessary because the inhabited islands are very close and would not have any warning. I think it’s considering there might be a large magma chamber under the ocean of which the visible volcano is just a tiny part. It probably depends on how deep the ocean is there. It might be shallow shelf sea which would make the fact it is an island sort of irrelivent as it would behave similarly to a continental volcano. Also the biggest volcano on old krakatoa island is rakata, which was apparently minimally involved in 1883. The other two volcanoes were both less than 200 meters tall but sort of wide and flat. So they probably wouldn’t have been much bigger than kadovar. Even without a caldera event, kadovar probably will look very different this time next year, in some way. See my comment below. I think you are onto something important Turtlebirdman. The usual cascadian suspects btw..
I’ve still got issues with my hip/thigh but there is progress..
Kadovar can be indeed a big problem. Interestingly it seems to be connected of a larger underground structure which also emerges 11km north as the Blup Blup island (also a very small island, only 400 meter tall). Little is known about both islands, only that they are active. Perhaps they can be part of a submerged 11km wide caldera, which emerges only as the Kadovar and Blup Blup islands. Another similar submerged caldera (but more exposed above water) is Rabaul, which is interestingly nearby. This volcano is one of the most prolific violent volcanoes I am aware of, which several very large eruptions in the Holocene and Pleistocene. Such calderas can be anything from entirely submerged, to just two peaks slightly above water (as it seems the case with Kadovar), to somewhat above water (like Rabaul) or entirely above water. And Papua is such a territory filled with these violent calderas, so it is a very good candidate for the next VEI6 or VEI7. The problem is that the region is highly remote and little investigated, so we know little about it. I was travelling near this region but west of Papua in 2016. Papua is really sort of “last frontier of the planet” kind of place. It looks like kadovar and blup blup are on a ridge with deep water around them. It drops off way quicker than I thought. I pictured it as being a shallow ocean and the volcanoes there were continental but had been surrounded by ocean after the ice age ended. But if both the volcanoes there are 2+ km tall then they are really actually not small at all, just low above sea level. But I guess small islands can have big eruptions and leave big calderas, and sometimes stop being islands. This area also sort of reminds me of the islands south of kyushu, where kikai kaldera is. I think those volcanoes also form in relatively deep water (>1 km) but not abyssal ocean. Kikai was probably the closest thing to a supervolcano that has happened during the holocene. I find the eruption estimate of 150 km3 to look too small, as tambora was comparable but tambora is still a huge mountain, while kikai is like the opposite of a mountain 🙂 Kikai is almost as big as taupo, which was formed in a borderline VEI 8. I dont think kadovar will be anywhere near this big, but I think its small size could make it underestimated and a much bigger eruption than expected could happen The eruption might be enhanced significantly by a vent opening at sea level, so that even a VEI 3 might have the explosive power of a large VEI 5. It would be good to know exactly if Blup blup and Kadovar are part of a ridge or part of a submerged caldera (like Santorini or Krakatoa). It would make a huge difference. But yes, ocean floor is quite deep around there. HI Irpsit. For the explosive eruptions of Krakatoa, are you referring to the mythical 6th century eruption? That never happened: it started as a vague attempt to link Krakatoa to the 540AD climate disaster and people keep repeating that statement. There is no debris layer from that time, in fact the next layer is many thousands of years old, in my recollection (don’t quote me on that: I can well remember when my memory was better than it is now). Clearly Krakatoa has exploded before but that evidence comes from the larger caldera. It is likely there were other explosive eruptions but we have no actual evidence about them. The Krakatoa eruption had several active vents on the island, along a line from the main peak. The explosion removed half the main peak, which is typical for a flank eruption. Even though the main peak itself did not erupt (as fas as we know), it was not passive. If the Papua volcano is located on a steep ridge, the main danger is actually from a flank eruption causing an underwater landslide. We don´t know for sure what caused the 536 event. It might have been one or two major volcanic eruptions (Rabaul has been considered a possible candidate), or an asteroid impact over an ocean. That´s not what I am referring to. What I meant to say is actually that Rabaul is part of the Bismarck Volcanic Arc, and that this region is a common offender in the category of major (and almost) supervolcanic eruptions, in the range VEI6 or 7 (with a VEI6 eruption about every 500-1000 years, which is impressive!). Another prolific region is Taupo (average of VEI5-6 eruption every 1000 years, and a VEI7+ eruption about every 30.000 years). Other similarly frequent regions for large eruptions include Mt Aso, Kyūshū, Japan. Thus anything that has the potencial to go caldera in these regions should be closely followed. Lake Ilopango is currently the most accepted candidate for the 536 event, but somehow my mind still considers the possibility of an asteroid impact, because of evidence found in ice cores. Either way, one would have to explain the evidence found in both ice cores (lack of a significant acid layer) and when did the Lake Ilopango caldera collapse occurred. Not new but very interesting to read. I have been seeing a bit of negative depths for EQs on Mona Loa and Kilauea over the last several days. What can cause this? I noted that the recent GPS measurements at Mauna Loa show much less scatter than they used to. There may have been an upgrade to the instruments or software. A couple of my nurses were philipino by origin. One was in PI when Pinatubo erupted. According to her, one of the main frrakouts WA trying to get the buildings evacuated when the roofs started sagging from the ash. An interesting “make him get up and walk around” conversation. She also seemed a bit surprised when I pointed out that the entire lake is the volcano at Taal. My 3:19 comments have typos. I’ll fix that later when I can get to my computer. I’m just happy that my kids and grandkids came through I’m a pinch when needed assistance getting to and from this thing. Passing on good thoughts for your recovery, GL! It seems you are blessed with several “families” to draw strength from. Dunno about that. I concider myself uniquely average. Geo, I’m glad to hear all went well. It’s so nice the kids and grandkids are helping you. That way you can take it easy and heal. Interesting article, Albert. I’m only half way thru reading it tho. Here’s a time lapse of Sinabung January 10 by YukiZE. Agung cam. I don’t think we’ve seen anything quite so energetic as this to date. Scroll it back to local time 17.56. Explosive and ashy. Quite a big pop! I notice from the western part of the crater, and it included that small side ‘steamer’ that has been going for a while. I wonder if that area got a good cracking from the explosion? The onset just fell out of the 2h buffer, so I didn’t have time to take a screenshot, but there was a clear bombardment of debris below the cleft. You could see it making a line of small puffs running down the mountain as it hit the ground. Could also have been a small pyroclastic flow, but I think it looked more like projectiles hitting the ground. I think it looked like the origin of the blast was from the edge of the lava lake that was steaming a lot before. Maybe what we are seeing is Agung’s pattern (like 1963, but on a much smaller scale). I think what is happening is that the “lava lake” or whatever you want to call it is cooling and getting harder, resulting in more violent explosions with decreasing frequency as the pressure needed to overcome the “plug” increases. Maybe the same happened in 1963. With the difference that in 1963 the amount of magma was much larger, resulting in the crater overflowing and later on in a much heavier and bigger “plug”, which, because the pressure was also higher, resulted in huge explosions. I think we are seeing the same mechanism in 2017/2018, but this time the pressure is much lower and the “plug” much smaller (the crater looks to be about 40% full this time…at most). There was a small, short lived pyroclastic flow from the cleft very shortly after the initial explosion. It didn’t travel very far, but it was definitely a flow. This video might be the recent activity? Yes that is most definitely today’s eruption. Also reporting increased severe winds around the same time, not sure if there is a connection at all. Also torrential rain (not unusual as it is Monsoon season in Bali) but there have been Lahars and even landslides, no doubt caused by the quake that happened at same time as Agung erupted. Really nice resolution on that video. I was watching off and on yesterday and the webcams were partially blurry due to rain. The seismograph saturated on it. But there was an even bigger event yesterday on the seismograph, but at a time the mountain was in cloud. So this may be the second such pop. is there a volcano there EQ 5.2 607.7 km SW of Eldeyjarboði (IMO)? is this rift phenomena? Dormant Tenorio volcano in Costa Rica awakening? Intense earthquake swarm going on for three days now. Possibly, but it started as an aftershock sequence of the M7.6 quake off Honduras. So unfortunately, I closed down my website big-volcanic.com. Unfortunately, I just didn’t have time to run it by myself, and the cost of maintaining it wasn’t worth it when I wasn’t able to consistently update it. Nothing to apologize for. Time is generally a persons greatest commodity. I knew I couldn’t do it, so I play a support function here. Even at that the needed time to research and write an intriguing article is hard to come by. The other issue I have is that I am far from an expert and have to rely on a “sniff test” of stuff that I write. That’s one reason I really like Alberts articles, he has the scientific chops to put together fantastic peices. Yeah, I’m impressed with how detailed and much Albert writes. As for scientific chops, it helps to have the mindset, but I’ve found if you can read other scientists’ conclusions and information, you can put things together even if you don’t come from a scientific background. I’m sure most scientists would appreciate more journalists who knew how to take their information and present it in a meaningful, insightful, and non-sensationalized manner. Albert’s articles are thorough, researched and entertaining. I just wish I had his skills. Good stuff, Albert! Sorry to hear that cbus, I enjoyed reading your articles. That is a pity but don’t let is stop you from writing! You had some good stuff. We’d be more than happy to host any musings here if you so wish. According to news Sources the Activity at Kadovar is strengthening. The fissure to Sea Level which had developed since Start of the eruption has apparently widened. Photohraphs show big vulcanian explosions. I wonder how this is going to turn out. And perhaps risky to stay nearby. How deep is the water there? That would give a better sense of the size of the stratovolvano or cone. The water is apparently at least 1 km deep around the island, except for a ridge that connects it to another island and which is shallower. I thought that the area was shallow flooded continental crust that was land in the ice age, but it drops off almost straight after the mouth of the sepik river which is the nearest mainland to kadovar. It is also very flat hence the tsunami and possibly pyroclastic flow warning if things get serious. Basically kadovar is actually at least 1.4 km tall and possibly quite a lot more. Looking at the mentioned pics we can be pretty sure that the livelyhoods of the people that used to call it a home are ruined. Good thing they were evacuated as soon as it started. The Krakatoa reference might be a bit alarmist but who knows, as far as I know this thing doesn’t have a know history or any research done on it? I mentioned the similarity to krakatoa because before 1883 I don’t think anyone knew it was an active volcano, and it’s first eruptions were small and later intensified. More than that is the proximity to the ocean and that the island has apparently collapsed at least once before which probably made a tsunami, and a collapse now would probably turn a relatively standard eruption into something much more notable. The Rabaul volcano observatory also consider the possibility of a major eruption and tsunami, though it isn’t considered likely. So it might appear alarmist, but it’s not without reason, and the eruption strengthening this quickly probably doesn’t suggest it’s nearing its end. I just concidered the source. These guys work with a similar system and know what they are talking about. Thar in itself makes it worthy of taking notice. I have never seen this before. Time lapse of the building dome at Mt St Helens from 2004 to 2008. Another view showing the Glacier in the crater moving as the new dome builds. Pathology results from the surgical margins indicate that they got it all, and the lymphatic samples came up clean. Actually gained some mobility today and was able to cough without doubling up in pain. I was unaware of it as well until I failed my psa test. Never had any indications, symptoms of any sort. Excellent news lurk, fingers crossed that this is the end of it. Hope recovery surges ahead! I’ll raise a glass to you when I next open the Bushmills! Great news, cancer is a b$%^& . Glad things are looking good. I’ll second that! Very happy to hear the good news. Some more pictures of kadovar. Apparently there is more than one vent that is now active, and the eruptions are now much more violent than before. The possibility of a vent erupting at or below sea level is not that low and might have already started, and this might cause things to really become significant. Even though this year just started and is only two weeks in, I think this might just be the pliny event of 2018. I guess if it does follow the krakatoa style of erupting, it might still be a fair way off from blowing itself apart though. Maybe in the next week to the start of March. The issue with kadovar is if it follows the outdated theory that krakatoa went kabloie because water intruded into the chamber. 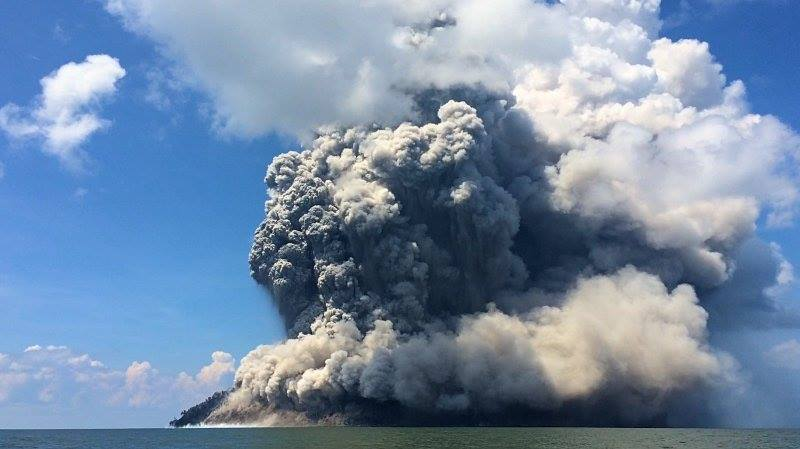 Turned out krakatoa went bonkers because of mixing of stagnant and fresh magma. But the water in the chamber model, though not the main mechanism for krakatoa, is still a plausible method of destruction. Kadovar will show us if it is real. Makes perfect sense in hindsight. It begins as a large plinian eruption (26 August 1883) caused by reactivation of an old magma body primed by fresh basalt injection. Most of the whole system is underwater, with only the uppermost part of the volcano emerging as 3 coalesced cones (Rakata, Danan and Perbuwatan). As the magma chamber becomes partly emptied, the ground over it, including the cones, starts to sag downwards and fracture. Seawater rushes in as some of the fracturing occurs underwater. As seawater enters hotter and hotter parts of the volcanic system, it flashes to steam, opening even more channels for water to come through, essentially “steam-fracking” the surrounding rocks. This accounts for some of the early big explosions of the morning of 27 August. The big one probably occured a bit after water reached the magma chamber proper, that is, seawater pouring in from the fractures of the forming caldera structure started to contact the remaining 1000°C magma and flashed to steam in a runaway process (think dumping liquid nitrogen into a vat of boiling water). Instant pressure rise on a tremendous scale. The rock held it in for a bit, until 27 August, 10:02 when everything let loose in a Tsar Bomba-sized explosion. Then, caldera collapse proceeded with accompanying tsunamis, and it was all over…. until a new cone began growing (probably very quickly) at the caldera rim, and surfaced in 1927. Hopefully, there is no big magma chamber under Kadovar that has reached the tipping point…. Since the island appears to be made up of very silica-rich andesitic lava domes, I’m quite afraid there is. Andesite or dacite doesn’t come out of nowhere, these kind of magmas usually form in large magma bodies festering away, cut off from their supply for millenia, long enough to have all the ferric and magnesian components crystallize out, and leaving behind a thick syrup of silica-rich rhyolite. All it takes to make it erupt, is injecting new hot basalt which provides energy in the form of heat (the stuff inside the chamber is 850°C, the new basalt bay be over 1100°C). It provides gas and pressure too. As everything mixes together, the rhyolite gets “basalted down” to dacite or andesite, and pressure sends it rocketing upwards. Technically the mixing magma method could also apply here too, only probably with less magma due to kadovar being in deeper water. Kadovar island is andesitic, but that probably only applied when it was last erupting, and now the magma is probably more evolved. This eruption probably started because of basalt intruding into the existing magma, and it probably mixed with it. The magma erupting now on kadovar is probably evolved (dacite?). 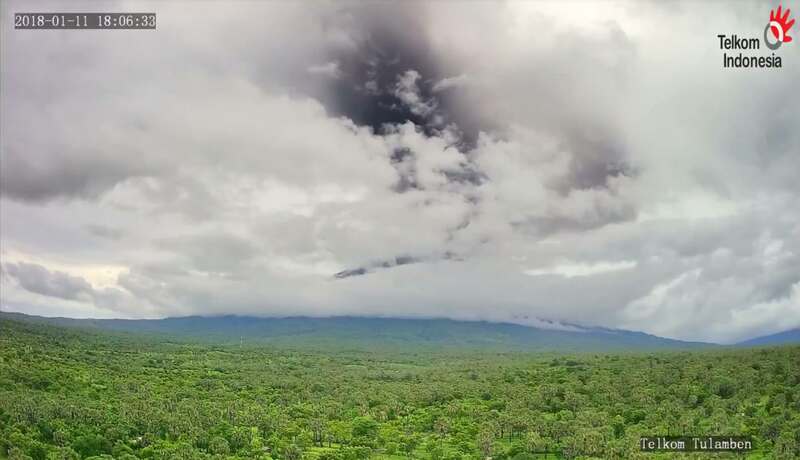 The magma that intruded was probably basalt similar to what erupts at manam volcano to the southeast of it, and to most island arc volcanoes that erupt frequently. Also neighbor islands evacuated. Authorities obviously takes this seriously! There is a vent near or in the ocean now. Anyone talking about Mayon in the Philippines?? Sky News have reported about the eruption. Well it is relevant as Kadovar is mentioned. flows (Johnson et al., 1972). Plenty of other islands read like they’ve had Mt. St Helens episodes or similar. New post is up: The Florida volcano. Or was it all fake news?